NOTE: If you plan to use a GPS unit to guide you to our office, be sure to enter “East” before “Pine Street” so it directs you to the correct location. Several of the I-4 exits and surface streets are under construction. For the latest updates regarding traffic pattern changes, please view the official website: www.i4ultimate.com or call their toll-free number: (844) 858-4636. 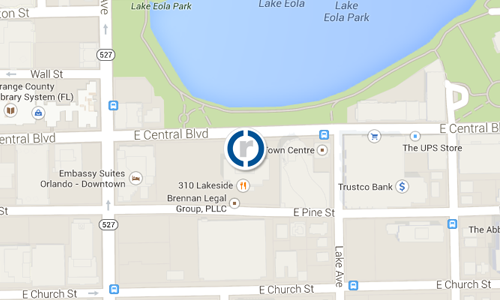 Complimentary parking is available in the garage across from our building on Pine Street. Please enter the garage on Pine Street, take a ticket, and turn right at the ramp to the second floor. As you drive up the ramp, you may park in any open “Visitor” or unreserved space. To park in one of RCG’s reserved spaces, curve to the right at the top of the ramp. Our parking spaces are labeled “#269” and “#270” and are located to the left of the elevator, facing Rosalind Avenue. Please be sure to bring in your parking ticket and we will be happy to validate it for you. You will scan the ticket upon exiting the garage.